Peter Vinall, left, and Robert Richardson of Sustane Technology show their hardware. The great and the good gathered at the Trade and Convention Centre in Halifax Wednesday evening to witness a substantial exercise in seed funding. Officially, they were at the awards gala for the I-3 Technology Startup Competition, watching Sustane Technologies of Chester win $225,000 for several awards, including the grand prize. But on a pragmatic level, what they saw was the culmination of a process in which 15 young companies from across the province received at least part of the money and expertise to launch successfully. This sort of competition has become an annual fixture on the Atlantic Canadian startup community’s calendar. 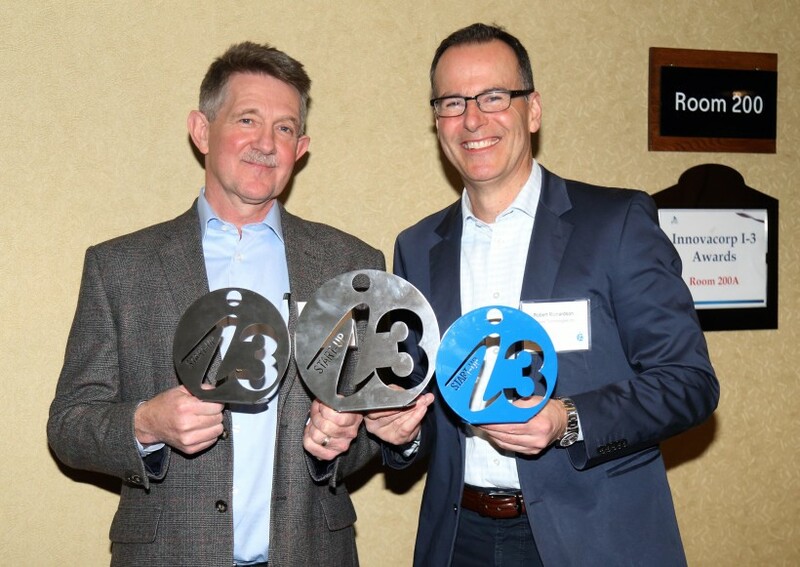 Innovacorp, the Nova Scotia innovation agency, holds its biennial I-3 event to conclude in every even year. And across the Bay of Fundy, the New Brunswick Innovation Foundation stages its Breakthru competition, always winding up in an odd year. There are two effects of these competitions — one very focused and the other much broader. First, there is the funding of young companies. Both competitions hand out several hundred thousand dollars in cash and in-kind services. It was $950,000 in the case of I-3. What that means is that a handful of companies will receive a portion of the resources they need in their first year or two. Sustane Technologies gets validation and $225,000 for being selected the winner of the South Shore zone, the waste diversion tech, and the overall I-3 winner. And $100,000 in cash and services will go to the other four zone winners: Lootbag of Antigonish; Airline Employee Travel Inc. of Elmsdale; Site 2020 Inc. of Halifax; and Orenda Software Solutions of Sydney. Ten other companies each received $15,000 to $40,000. It will help. Consider the regional winners from the 2013-14 I-3 competition. Grand prize winner Heimdall Networks, which won $225,000, has changed its name to Mimir Networks, but the digital security company has continued to grow in the past two years. The other regional winners have gone in the right direction. Spring Loaded Technology of Dartmouth is gearing to launch its knee brace that strengthens and stabilizes the joint, and CEO Chris Cowper-Smith won the 2015 BDC Young Entrepreneur’s Award. Cellufuel, the South Shore winner two years ago, announced a $5-million funding round last summer to finance the construction of its demonstration plant at the ReNova Scotia Bioenergy site in Brooklyn. So the funding helped the winners. But these contests do serve a broader purpose. They help to get potential entrepreneurs, people with ideas but limited business experience, out of their basement and into the arena. Both Breakthru and I-3 offer boot camps to entrants. That helps people with good ideas to move forward, and those with bad ideas to move on quickly. It’s difficult to over-emphasize the importance of weeding out bad ideas fast. Will all of the winners succeed? Probably not. It’s simply the nature of the startup model that a lot of these companies, even those with great ideas, stumble and fall. But Sustane and the other winners now have the chance to at the very least flesh out a solid business plan and improve their chances of success.